Correct selection of the appropriate attacking tool is vital in order to most efficiently smite your opponent; similarly, using the appropriate blocking tool will allow you to deflect your opponent's attacks more comfortably. Using the wrong tool will clearly be less efficient, and may even result in injury to yourself. Each attacking tool should be aimed to attack an appropriate vital spot using a correct technique; see the section on Targets for detail on what goes where. The images herein show the major attacking and blocking tools, as well as many of the less commonly used ones. There are even more still, but if you want to know those you'll just have to come training on a regular basis, or download the reference attacking and blocking tools (pdf file, 1.7Mb). 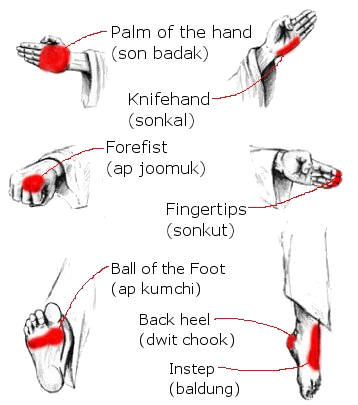 Please note that incorrect use of some of these tools could result in injury to the user; correct teaching of the proper application and extensive practice is advised before use in a real-life situation.